I’ve decided to publish a few entries called “First Week of School”. These will be a series of entries about things I do to prepare for that exciting first week of school! 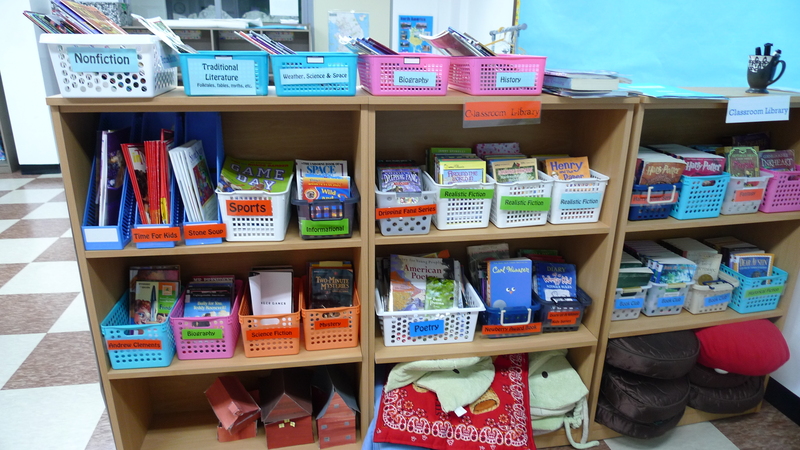 One of my big projects to get done before school starts is organizing my classroom library. These past 2 years, I’ve been able to accumulate some more books for my classroom library. During my first year, I got a lot of free books from scholastic book orders. Last year, I also had students donate old books to our classroom library as well. Also, I had to spend a lot of my own money to buy more books. This summer, I also ordered used books from amazon.com. You can find used books for really cheap, in fact the shipping cost more than the book. Even though they are used books, they are in pretty good quality. Another place I like to order books from in Korea is through http://www.whatthebook.com. This site is in English and the prices are reasonable. Plus, you can have them deliver the books to you or you can pick them up at the Itawon store. This year I will finally move to a system of having bins for our books! I didn’t really have enough books to have a system with using bins before. I bought a bunch of colorful 1,000KRW (About a $1) bins from Daiso. This is like the Japanese dollar store version here in Korea. After organizing and sorting through my books, I realized that I needed more bins! I need to buy some more bigger ones for the picture books I have. I totally forgot to print out nonfiction book bin labels as well. However, I’m excited that the classroom library is almost ready. I can’t wait to show my new and old students the “new” classroom library!